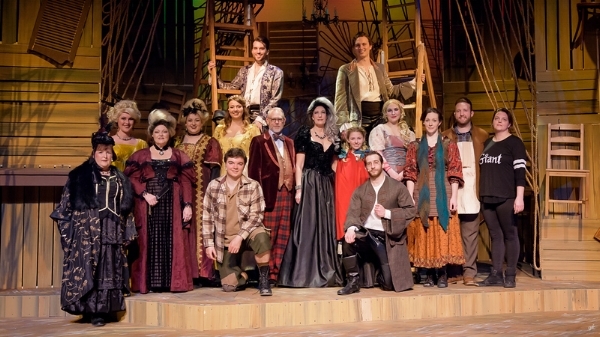 Fairy tale characters appear in Sunset Playhouse's "Into the Woods." Pictured, from left, are Jack (Simon Earle), Cinderella's stepmother (Barb McGuire), Stepsisters (Sarah Briana Monahan and Ashley Patin), Cinderella (Hannah Esche), Jack's Mother (Paula Garcia), Baker's Wife (Carrie A Gray), Baker (Nathan Marinan) and Little Red Riding Hood (Ella Rose Kleefisch). At the end of Act I, all the characters seem to have gotten exactly what they wished for: Cinderella and Rapunzel got their men, Little Red Riding Hood and her grandmother got freed from the Wolf, Jack got rich – and his beloved pet back -- after climbing the beanstalk and slaying the Giant. And the Baker and his wife? They got their baby. Setting the bar very high is Esch, whose Cinderella opens the show with a lovely soprano voice befitting a fairy tale princess. Other characters are also introduced in the “Into the Woods” prologue, each displaying an equally strong characterization. I especially enjoyed Kleefisch’s feisty characterization of Little Red Riding Hood. Marinan has such a sincere quality as the Baker and is nicely paired with Gray. Marinan is especially effective as the Baker sings “No More,” in which he wishes to run away and put an end to all the witches and giants in his life – a metaphor for his troubles. While other stagings of the show might be more literal, using mostly a woods backdrop, this production chooses more of a metaphor – at least that’s the way I see it. The stage is surrounded by large panels on which are hung – in a helter-skelter manner – chairs, small tables, shutters and other wood items as well as ropes in a jumble of patterns. Perhaps it is symbolic of the chaos that surrounds the characters and the swirling array of decisions they have to make that define them and teach their children. It sort of reminded me of a still life of Dorothy and the swirling objects that surrounded her in the tornado scene in “The Wizard of Oz.” Cleverly, the chairs toward the bottoms of the panels are often used as set pieces and then hung back up.